With a roar of delight, team members at Everything Dinosaur have got their hot little mammalian hands on the first of their very own clothing range, dinosaur themed sweatshirts for children that feature a T. rex on the front. The company has been working on a number of new product ideas and it had long been an ambition to create a range of children’s clothing that featured high quality and scientifically accurate dinosaur images. The super Tyrannosaurus rex skull motif on the front is based on a real fossil T. rex skull discovered in 1992 (STAN – BHI3033), to give the specimen code and each stitched design has between 20,000 – 30,000 individual stitches in it. The sweatshirts are a 50% cotton/50% polyester weave and they were chosen as they are very good quality and match the typical sweatshirts and jumpers used in school uniforms. Available in three colours for the moment, sky blue, royal blue and red (T. rex red as we call it), the stitching work is done in England, as the team members at Everything Dinosaur wanted to support the British textiles industry. Three sizes have been introduced so far with an age range from 3-8 years (chest size from 26″ [66cm] to a generous 30″ [76cm]) and having fulfilled the company’s commitments to those customers who had reserved one, this new addition to Everything Dinosaur’s clothing range has now gone on general sale. The Tyrannosaurus skull material on which the motif is based represents one of the most complete and best preserved T. rex skulls found to date. The fossil material was found in South Dakota (United States) and in all, about two thirds of the entire skeleton was discovered. “We carried out research amongst our customers as to what they wanted and got feedback on choice of sweatshirts and what colours to stock,” she added. “Then once the drawings had been approved by our team, it was just a matter of trying to find a textile company that could produce such a high-quality garment based on our specifications”. The hard work and dedication of the staff seems to have paid off, as once customers got to hear about the company’s plans Everything Dinosaur received a lot of requests to have clothing items reserved. Now that the last of the reserved clothing has been sent out, team members can focus on putting this new and unique clothing range on general sale. T. rex fact sheet sent out with every sweatshirt. As part of Everything Dinosaur’s commitment to education, each T. rex sweatshirt is sent out with a Tyrannosaurus rex fact sheet written by the prehistoric animal experts in the company. Children get to wear a T. rex skull on their chest as well as to read all about the “King of the Tyrant Lizards”. Staff are already working on a number of other clothing ideas, with the intention to add more items to their clothing range with “rex appeal”. At one time feathered dinosaur fossils from the Jurassic and fossils of creatures identified as being Mesozoic birds, were as rare as “hen’s teeth”, however, the fine grained and fossil rich sediments of Liaoning Province (northern China), have changed all that. A substantial amount of fossil material of primitive birds and feathered dinosaurs has already been discovered and large numbers of specimens await further study in museum storage. One such specimen, unearthed by a farmer, purchased by a local fossil dealer, sold on and in storage at the museum at the Fossil and Geology Park in Yizhou until last year, has helped scientists to re-write the bird/dinosaur lineage and re-established Archaeopteryx as a primitive member of the Aves (birds). The half metre long specimen has been named Aurornis xui, the genus name means “dawn bird” and the specific name honours the famous Chinese palaeontologist Xu Xing, a scientist who has been at the forefront of research into feathered dinosaurs. Like many fossils from this part of China, the specimen was acquired through a fossil dealer. The dealer claimed that the specimen had been found in western Liaoning and that it came from the Tiaojishan Formation, which dates from 165 to around 153 million years ago. Tests on the rock confirmed this assertion and the authors of the scientific report, published in the journal “Nature” estimate the specimen to be around 160 million years old. Known from just a single fossil - A. xui. The head of the animal faces to the right of the picture, the long tail and limbs can be clearly seen. The slight, discoloured (black/grey) staining above the base of the tail, along the back of the neck and at the front of the chest may represent evidence of the presence of feathers. There are a number of primitive skeletal features present, along with traces of feathers on the long tail, neck and chest. The research team, headed by Pascal Godefroit from the Royal Belgian Institute of Natural Sciences have placed Aurornis at the base of the Avialans, a group that includes true birds and their close relatives since the divergence away from the Dinosauria. "Dawn Bird" a basal member of the Avialae. Furthermore, the research team carried out an in-depth phylogenetic analysis of bird/dinosaur specimens which has led them to conclude that Archaeopteryx, once placed outside of the Aves and regarded as not being part of the Aves evolutionary lineage, should be re-assigned and placed back with the birds. The first fossils of Archaeopteryx (A. lithographica) were found in the 1850’s and in 1861 a beautifully preserved almost complete specimen was unearthed. Here was a creature from the Upper Jurassic strata of Solnhofen (Germany) that had feathers, skeletal features which resembled birds, but also with teeth, claws and a long tail. The specimen seemed to be a transitional form between reptiles (Dinosauria) and birds. However, feathered fossil finds from Liaoning Province had led a number of scientists to re-assign Archaeopteryx and place it in a less pivotal position on the evolutionary path towards true birds. This re-classification of Archaeopteryx, placing it within the Dinosauria Order rather than with the birds, implied that powered flight must have evolved at least twice amongst different, but related types of creature. The evolutionary line to the true birds evolved powered flight and thanks to this re-assignment of Archaeopteryx fossil material, a form of convergent evolution must have occurred with a evolutionary line of bird-like dinosaurs evolving powered flight too. This new research places Archaeopteryx, Aurornis and the genus known as Anchiornis (discovered in 2009) at the base of the Avialae lineage that would give rise to the true birds. To read an article about the implications of the discovery of Anchiornis: In a Flap over Feathered Fossil Discoveries from China. This scientists state that Aurornis xui was very probably incapable of powered flight. It could have been a glider as its feathers were not the contoured, complicated pennaceous flight feathers seen in extant birds. This new analysis of the known fossil material has implications for a number of genera once classified on the Dinosauria side of the dividing line between dinosaurs and birds. The fossils of a number of members of the Troodontidae, a family of bird-like dinosaurs have also been re-examined. The cursorial predator known as Balaur bondoc, a bizarre, highly specialised, Late Cretaceous carnivore from Romania (Hateg Island), which resembled Velociraptor has been placed within the Avialae. Like Aurornis, Balaur bondoc could not fly unlike the rest of the Avialae, so far assigned. The wider implication for this research is that if powered flight only evolved once in the Dinosauria, then feathers most certainly evolved initially for other functions, flight was a later, secondary consequence of the evolution of modified scales that eventually become feathers. Feathers may have first evolved as visual communication devices, to show status in a pack structure or hierarchy, or to help brood eggs during the nesting season. A study published in the on line academic journal PLoS One (public library of science) looking into the relationship between dog and human burials has revealed some strong links between our species and that of the dog. It seems that dogs had a special place in the working lives of our ancestors and from various grave goods and the symbolic positioning of dogs in burials, they may have had a strong spiritual bond with their human masters. The lead author of the study, University of Alberta (Canada), anthropologist Robert Losey and his team studied a number of ancient burial sites but their research focused on dog burials in the Lake Baikal region of eastern Siberia. One of the objectives of the team was to determine if the practice of dog burial and the inference of a close relationship between these two species correlated with patterns of human subsistence. Evidence of a spiritual bond? The traditional picture of the dog, or the ancestral dog (a wolf), becoming a partner in the hunt for terrestrial game working alongside humans and sharing the spoils has been challenged as evidence from this region (eastern Siberia) suggests although man and dog had an affinity, large terrestrial mammals such as deer played only a minor role in their diets. Dog burials of any kind were the most common during the Early Neolithic (7-8,000 years ago), only foraging groups, the hunter/gatherers seem to have buried dogs. As mankind began to live in settlements and farming communities developed so most cemetery sites that were established are devoid of buried dogs, with the exception of some sacrificed animals. Both the diets of the people and the dogs seem to have been broadly similar across the regions that were studied. Unsurprisingly, around the Lake Baikal sites most of the protein in both human and dog diets was obtained from fish with some evidence of predation on the local Lake Baikal freshwater seal population. Evidence from the burials reflect the close association between the human population and the dogs. One dog, for instance was laid to rest as if it were sleeping, whilst another burial site revealed the body of a man who had been buried with two dogs, one either side of his body. Other dog burials show evidence of grave goods, even items that may have been designed with the dog in mind during life. The research team found evidence of a dog being buried with a round pebble, possibly a favourite toy, carefully placed in its mouth. Other dogs were buried with ornaments and tools such as spoons and stone knives. Deer and other remains buried with a dog. Some of today’s pet owners give their dogs special collars. Others get special items of clothing, not necessarily designed to keep the animal warm but simply to make a fuss of them. People tend to demonstrate anthropomorphism (applying human feelings to animals, treating animals like people). It seems this practice has very ancient roots, as one dog burial revealed a dog had been given a deer-tooth necklace to wear. Deer-toothed necklaces were a common item of jewellery amongst people and it seems that some of these folks liked to dress up their dogs too. DNA analysis of the dog remains indicate that all the animals in the Lake Baikal burials were similar in size and appearance to the large husky dogs more associated with the far north and sled pull teams of today. From the evidence gathered by the research team, the dog/human bond goes back a long way into human history and as hunter/gatherers we had a very strong bond, perhaps even a spiritual bond with the dog. Today marks the sixth anniversary of the Everything Dinosaur web log. Six years ago, a team member at Everything Dinosaur produced the first of what is now nearly 2,200 articles. We try and update the blog every day, producing articles on the latest fossil finds, updates on research, answers to customer’s questions all sorts of things with a general prehistoric animal theme. Over the last few years we have reported on approximately seventy new dinosaur species, written over three hundred reviews, produced more than five hundred and fifty articles for ezine inclusion, showcased the work of over one hundred and fifty schools and their dinosaur themed activities and posted up over fifty videos. Our web log has attracted hundreds of comments and team members at Everything Dinosaur have responded to all those that required a reply. The web log provides a useful resource for schools and for dinosaur model collectors. It also provides information on palaeontology and other aspects of research into the Dinosauria. So comprehensive is the blog, that it contains over 1,000 in depth articles many of which have been republished elsewhere. Celebrating six years of blogging. We look forward to writing more articles and to continuing our web log, roll on article 3,000 – scheduled for sometime in late 2015. In the meantime, happy birthday Everything Dinosaur’s blog! The reception classes at Preston Hedges Primary School have been busy studying dinosaurs this term and getting very creative with their dinosaur themed arts and crafts. The teachers of the two reception classes, Miss White and Mrs Pearce, ably supported by Mrs Luck, Mrs Smith and Mrs Kellingray have been encouraging the budding young palaeontologists to design very colourful dinosaur posters and identify features of their prehistoric animal drawings. The children are being encouraged to make observations about animals, make comparisons and to use words to describe different dinosaurs. The children clearly enjoyed drawing the prehistoric animals and labelling them, naming features such as claws, head, tail and tummy. It seemed that long-necked dinosaurs (Sauropods) were the most popular type of dinosaur with a lot of the reception-aged children deciding to draw one of these plant-eaters. The children have already learned about carnivores and herbivores and they were using such terms with confidence. The stimulating indoor and outdoor classrooms are very well resourced and Alex, the resident dinosaur expert was in his element helping all his classmates learn about dinosaurs. Harry demonstrated his knowledge of Tyrannosaurus rex teeth by commenting that they were as “big as bananas and shaped like a big banana too” – very impressive. Sam opted to draw a four-legged dinosaur and he and his friends were having fun as they learned. The teaching team have been building a large model of a long-necked dinosaur. We have been reliably informed that this dinosaur is going to be called Dave and we have been promised a photograph of the school’s prehistoric creation when the model is finished. The term topic is certainly proving an excellent framework for developing plenty of numeracy and literacy based learning. Even aspects of design and technology are being covered. For example, as well as helping to make the large dinosaur model, the children have sculpted their own clay replica dinosaurs. This provides the children with the opportunity to explore the properties of different materials and to make comparisons between various types of extinct animals. With plenty of guidance, the young palaeontologists have created quite a collection of different clay models, we referred to them as the “Cretaceous Clay Model Collection” and there are some fascinating interpretations of the Dinosauria, that’s for sure. The term topic is going down well with the two classes and the enthusiastic teaching team have prepared some intriguing schemes of work to help enrich the children’s learning experience and to permit lots of differentiation. We look forward to receiving some pictures of Dave – a dinosaur mascot for the school. The Chinese Academy of Sciences has done much to help research and explore the amazingly rich fossil strata of much of China over recent years. Today, bodies such as the world famous Institute of Vertebrate Palaeontology and Palaeoanthropology (Beijing), are at the cutting edge of dinosaur research. Indeed, this institute now houses the largest collection of vertebrate fossils in the world. However, in a society where many fossils ended up being ground down for use in traditional medicine and where many superstitions about disturbing fossils still persist we thought it appropriate to pay tribute to just one dinosaur, the discovery of which helped transform attitudes and helped to lay the foundation for much of the academic work focusing on vertebrate palaeontology that goes on in China today. The Yunnan Province in south-western China has provided scientists with a number of excellent dinosaur specimens, some of the most important are the fossils of the Prosauropod Lufengosaurus. Prosauropods are a group of herbivorous, lizard-hipped dinosaurs that evolved in the Triassic and become the dominant large plant-eaters in many ecosystems across Pangea. 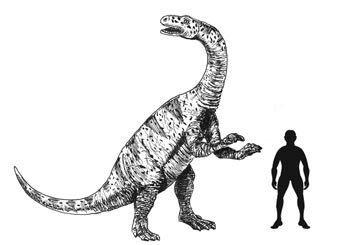 They are related to the Sauropods, Jurassic giants such as Apatosaurus, Brachiosaurus and Diplodocus. Providing information on life after the Triassic/Jurassic extinction event. Chung Chien Young (Yang Zhongjian in Chinese literature), formerly named and described Lufengosaurus in 1941, a time when China was engaged in a brutal war against the Japanese. A second larger species from Yunnan Province was described in 1947, when China was still gripped in turmoil with revolution and civil war. This long-necked, six-metre long dinosaur and other vertebrate fossils from Yunnan have provided Chinese scientists with a unique insight into the diversity and the radiation of the Dinosauria following the Triassic/Jurassic extinction event. Fossils of vertebrates from Lower Jurassic strata are exceptionally rare and the Chinese discoveries really helped put this part of the world on the “map of global palaeontology”. The Lufeng Formation become globally significant as scientists attempted to understand the consequences of the Triassic extinction event on terrestrial life. Lufengosaurus fossils and specimens of other herbivorous dinosaurs plus the remains of several different types of large, meat-eating dinosaurs have enabled palaeontologists to build up a detailed picture of life in this part of the world around 200 to 195 million years ago – a time of transition in vertebrate faunas with the emergence of the dominant Dinosauria. The work of a number of Chinese scientists and academics during the 1940s and 1950s helped to build the reputation of China in the study of palaeontology and provided the impetus for much of the research that was to follow in the last decades of the 20th Century. Lufengosaurus may not be the most famous of all the dinosaurs, but it has played an important role in the development of palaeontology and other Earth sciences in China. A few weeks ago team members at Everything Dinosaur asked which of the vast array of dinosaur and prehistoric animal models, would our customers and blog readers like us to produce a video review of. Our thanks to everyone who sent in suggestions, one of the most popular requests was for a review of the Carnegie Collectibles Spinosaurus dinosaur model made by Safari Ltd. Ever since Spinosaurus appeared in the third of the Jurassic Park films it has become a firm favourite amongst dinosaur fans and a number of manufacturers of dinosaur figures and models have made replicas of this large Theropod. Fossils of this particularly large, sail-backed, dinosaur are extremely rare and the first fossils to be discovered, those used to scientifically describe Spinosaurus over 100 years ago, have been lost, many scientists consider Spinosaurus as the largest carnivorous, land-living animal known. With fossils having been found in Morocco and Egypt, palaeontologists are fairly certain that Spinosaurus lived in a sub-tropical habitat which was dominated by many rivers and large bodies of water. The skull of the largest specimen known has been estimated to have measured nearly two metres in length, longer than any Tyrannosaurus rex skull material found. The narrow, slender dentary, lined with conical teeth help support the theory advanced by a number of palaeontologists that this dinosaur was a piscivore (fish-eater). Although, in all likelihood this predator would have happily scavenged carcases and eaten any smaller dinosaurs that it could catch. This model (seen in the picture above), shows lots of amazing detail. For instance, the prominent crest on the top of the skull which is painted a vivid, bright red colour and the subtle skin texture which has been created by the Safari Ltd design team along the flanks of the figure. More than a third of the model’s length is made up of the tail. Consequently, this replica has a more slender, lighter appearance than other more robust-looking Spinosaurus models that are available. There is much debate as to the body proportions and the bulkiness of this dinosaur. This Carnegie Collectibles replica depicts this dinosaur as a lighter, more agile hunter. Estimates of the weight of this dinosaur vary considerably from around four tonnes to perhaps as much as twenty tonnes so it is not surprising that there is so much variation in Spinosaurus figures that are available. To help create a more complete picture of Spinosaurus, especially S. aegyptiacus, palaeontologists have based their work on comparisons made against more substantial and complete fossil material from related members of the Spinosauridae. An example of this is, although no fossils of the arm bones have been found to date, most scientists believe that this dinosaur had strong, powerful arms, much longer than an equivalent sized Carcharodontosaurid Theropod. In the model of Spinosaurus manufactured by Safari Ltd, the arms are indeed quite long. Different interpretations of fossil material. The Carnegie Collectibles Spinosaurus dinosaur model measures approximately thirty-five centimetres long. The hip height is about twelve centimetres and the height of the head approximately thirteen centimetres. Safari Ltd state that this is a 1:40 scale replica, however, since the size estimates of Spinosaurus vary considerably it is difficult to give a precise scale to most models of this dinosaur. As with all Safari Ltd models, the Carnegie Collectibles Spinosaurus is very well painted. On our stock, the famous sail, has a dark brown fringe with regular orange coloured , triangular markings running down the sides . This artwork suggests that the design team at Safari Ltd have opted to depict this sail-like structure as a striking communication device perhaps used to deter rivals in confrontations over feeding territories. All in all, an attractive dinosaur model, one that is proving very popular with collectors and dinosaur fans. At Everything Dinosaur we get sent in pictures of all sorts of prehistoric animals. It never ceases to amaze us how creative our customers are and some of their studio shots and model scenes are absolutely fantastic. However, to get that realistic shot of a dinosaur, to reproduce a scene from a movie, you don’t necessarily have to be limited to working indoors. Even in the north of England, in between the showers you can get the chance to set up a dinosaur themed diorama in a garden. A border can become a backdrop to an encounter between an Allosaurus and a Barosaurus, the garden pond can become a watering hole for a herd of hungry horned dinosaurs, some of the imaginative shots sent into our offices are very creative and extremely skilfully done. Take this example, using a Papo Tyrannosaurus rex figure sent into us by Alan. Using the right vegetation, careful lighting and interesting angles some amazing shots can be achieved. Clever and creative use of dinosaur models. When we were discussing how this photograph had been staged, it reminded us of the Tyrannosaurs seen at theme parks that are situated around corners so that you come across them unexpectedly. Alan refer to the Papo range of models as “stars”, they are ideal for his photographic work. The fine details and dramatic poses make them excellent subjects for Alan’s creative endeavours. It may have been one of the coldest springs in the UK on record but things are hotting up at Everything Dinosaur as team members work on a number of projects and finalise plans for the summer. The company’s busy timetable over the next few weeks is to complete the launch of its first own branded dinosaur themed clothing – the long awaited and much anticipated Tyrannosaurus rex skull sweatshirts. Already a significant amount of the first stock has been sold, but we promise to help and assist all those who want one. Watch this space for more news. The teaching programme is as busy as ever, with our hardworking teaching team trying to squeeze in all the scheduled school visits into what is, a fairly short summer term for schools. We also have a number of scheduled summer events and activities. Our new dinosaur themed, quirky presentation tentatively entitled “kissing with dinosaurs” is coming along nicely although procurement seem to be struggling with the various odd requests that are coming in. Can we utilise the Mastodon tooth? Along the lines of the more bizarre requests received so far is the one for a gross of “wet wipes”. Not sure what they are up to but it sounds intriguing – we shall keep you posted. There has been a great deal of research in recent years into the feeding methodologies of big Theropod dinosaurs, with much of the work centred on the Allosaurus genus. The relative abundance of good skull material associated with this genus, especially material from the Morrison Formation of the western United States, has permitted a number of detailed studies into Allosaurid feeding behaviours. A team of researchers at Ohio University have published a new paper which suggests that Allosaurus (A. fragilis) had a more delicate method of de-fleshing a carcase, feeding in a similar way to a modern-day falcon. Allosaurus fragilis was one of the apex predators of the Late Jurassic of North America. Some specimens measure over eleven metres in length and scientists have estimated that this predator may have weighed as much as 2.5 tonnes. However, studies of the skull and jaw suggest that this dinosaur had a much weaker bite than comparable sized Tyrannosaurids. The famous “Big Al” Allosaurus skeleton, representing a sub-adult individual which was found in Wyoming back in 1991, has been extensively studied. Three-dimensional studies show that the Allosaur skull was extremely good at transmitting forces along its length, although it was much lighter than the massive skull of a Tyrannosaurus rex. The Allosaurus skull was very strong, but analysis of the bite force that this carnivore could generate revealed a surprise. Tests showed that Allosaurus had a bit force not much stronger than an extant leopard, an animal just one tenth the size. Allosaurus was not capable of crushing bone, it was not able to dismember prey through sheer force generated from its jaws. The research team included mechanical engineers, palaeontologists and experts in computer model analysis. Using three-dimensional CT scans of Allosaur skull material and cervical vertebrae, the scientists carefully reconstructed the muscle and tissues on the head and neck of this dinosaur from the bones outwards. Using a technique known as “multibody dynamics”, from robotics, the researchers ran a number of sophisticated simulations that explored how Allosaurus may have used it head and neck to attack prey and then to feed. Note the narrow lower jaw, reflecting studies that show a relatively weak bite. A key finding of this study was an unusually placed neck muscle called the longissimus capitis superficialis. In most meat-eating Theorpods, for instance the Tyrannosaurids, this muscle passed from the side of the neck to a bony wing on the outer back corners of the skull. In the analysis of the Allosaur skull material it was discovered that the longissimus capitis superficialis was attached much lower on the skull. This muscle acts like a jockey pulling on the reins of a horse’s bridle. If the muscle on one side contracts, it would turn the head in that direction, if the muscles on both sides pull, the head is pulled straight back. The study into the skull dynamics and the effect of this lower position in the skull of this specific muscle suggests that this dinosaur could drive its head down into prey, hold it there and then pull the head straight back by flexing its neck and body. In this way, flesh would be ripped from any carcase, especially if the hind feet could be placed on the corpse to provide more leverage. A spokesperson for the research team, described the potential feeding mechanism of Allosaurus like the mechanics of a backhoe that rips into the ground. The same method of feeding is seen in small birds of prey such as falcons and kestrels. Alligators for example, tend to grab anything within striking distance with their mouths and have a very different feeding mechanism when compared to that of an Allosaurid. This approach using both engineering, anatomy and computer analysis also revealed that the heavy head of a Tyrannosaurid would have made it difficult for this type of dinosaur to speed up or slow down its head movements or to change its course as it swung its head around. The light, highly pneumatised head of the Allosaur probably meant that Allosaurus could turn its head much more rapidly than an equivalent sized Tyrannosaur. "Watch the Birdie"! Allosaurids may have fed like kestrels and falcons. A modern-day kestrel (a small falcon) is perched atop the skull of the Jurassic predatory dinosaur Allosaurus. A key finding of the new study is that Allosaurus had a feeding style similar to falcons. In both cases, tearing flesh from carcasses involved grasping meat with the jaws and tugging back and up with the neck and body. Having a lot of mass sitting far away from the axis of head turning, as in T. rex, increases rotational inertia, whereas having a lighter head, as in Allosaurus, decreases rotational inertia, the researchers explained. An ice skater spins faster and faster as she tucks her arms and legs into her body, decreasing her rotational inertia as the mass of her limbs moves closer to the axis of spinning. Earlier studies (Emily Rayfield, University of Cambridge etc. ), proposed that Allosaurids may have used their head like an axe. Strong neck muscles to ram the upper jaw teeth into the body of its victim. Every impact on the body of the prey animal would have resulted in the Allosaur’s serrated teeth tearing through muscle leading to substantial blood loss and trauma. This new research builds on the earlier data and supports the idea that the head of Allosaurus was light but strong and it could move its head and neck around quite quickly and with considerable control. It may not have had the strength of a Tyrannosaur but the proposed de-fleshing feeding technique and method of dispatching prey suggests that this dinosaur was a highly successful apex predator. It seems that not all the Theropods had the same feeding styles or methodologies. This research supports the theory that Allosaurus fed by gripping with its jaws and tugging upwards and backwards with its strong neck muscles – a sort of “gripper and a tugger” feeding method.